The Coolest Guys to Ever Hit the Vegas Strip! Frank Sinatra, Dean Martin and Sammy Davis, Jr. 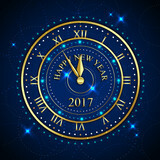 This New Year’s Eve some of us movie junkies are staying in for the festivities. If you’re doing the same, I recommend adding to your viewing list, “Ocean’s 11.” It’s a great New Year’s Eve, buddy movie and heist caper all in one. What better way to ring in the new year than with the coolest guys to ever hit the strip. Look out Vegas, here we come! The Rat Pack: Frank Sinatra, Dean Martin and Sammy Davis, Jr. Performers commonly associated with The Rat Pack: Joey Bishop and Peter Lawford. Danny Ocean isn’t really a fictional character, he IS Frank Sinatra. Believe it, his boys would do anything for him. Except for Dean, he was the only one who ever said no to old blue eyes. Frank really dug Dean’s truthfulness. Whenever one of the “Pack” was performing at a club in Vegas, the others would show up to support and usually put on an impromptu performance. While they were in town, Las Vegas was jam packed with admirers hoping to catch a show. 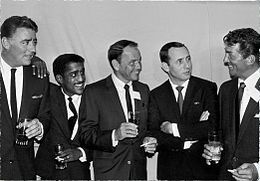 This performance was on June 20, 1965, featuring, Frank Sinatra, Dean Martin and Sammy Davis, Jr. Johnny Carson (known for The Tonight Show) served as the emcee, filling in for Joey Bishop who had hurt his back. It would be their only televised concert together. Set in Prohibition-era Chicago, the film is a take on the classic Robin Hood tale. This engaging musical features the Academy Award nominated song “My Kind of Town” sung by Frank Sinatra. My favorite number is “Mr. Booze” sung by Bing Crosby. I love this scene because Robbo’s (Sinatra) club miraculously converts into a mission (due to some clever architectural tricks) to fool the police during a raid. Robbo’s gang breaks into the gospel version of “Mr. Booze” with Alan A Dale (Crosby) preaching and Little John (Dean) testifying on the lessons of temperance. Peter Lawford was originally cast as Alan A. Dale, but due to a falling out with Frank Sinatra, Bing Crosby took over the role. At the time, Lawford’s brother-in-law was President John F. Kennedy and Lawford had arranged for The President to stay at Sinatra’s home. However, because of concerns over Frank’s ties to the “Mob”, the plans were scrapped. “Bang, Bang!” sung by Sammy Davis, Jr.
My favorite Rat Pack movie reference line is from Clueless (1995). “What’s with you kid? You think the death of Sammy Davis, Jr. left an opening in The Rat Pack?” Too hilarious!! Over 50 years later, Frank Sinatra, Dean Martin, and Sammy Davis, Jr. are still the coolest guys to ever hit the Vegas Strip! This entry was posted in Actors, Actresses, Classic Films, Comedy, Film History, Musicals and tagged #iheartfillmblog, #The Rat Pack, Dean Martin, Frank Sinatra, New Year's Eve, Ocean's 11, Peter Lawford, Robin and the 7 Hoods, Sammy Davis. Bookmark the permalink. Loved your post. I loved the rat pack too and thought they the coolest dudes walking (at the time). Actually, they be the coolest ever! I think no other group of dudes will ever take their place.